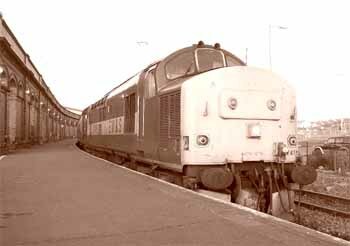 A photo report following the journey of 37415 from Crewe to Holyhead and back. 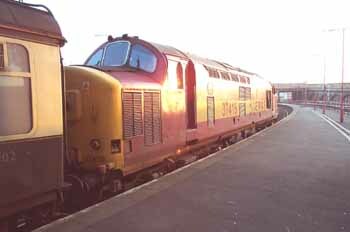 I received a call from the Prestatyn Observer this morning to say that an EWS 37 had passes through on 1D57 at around 07.15. 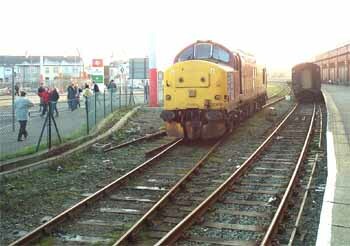 I had been waiting for the opportunity to return to Holyhead behind a 37/4 so we were on. 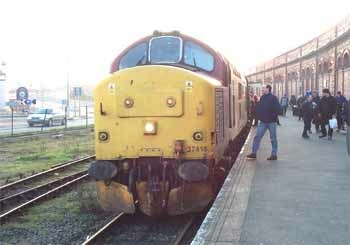 A quick visit to Crewe to check 1G96 and all was well so I returned for 13.19 and 1D71 - for Holyhead. The train was lightly loaded but left just a few minutes down, the stock was 5025, 4963, 17056 and 4902 and guess what? - 4902 had an irritating wheel flat. 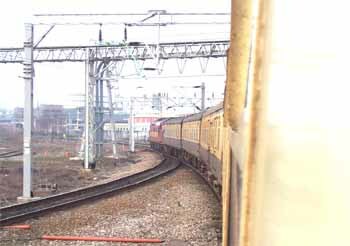 This shot is taken from the train leaving platform 11 and I decided to continue the practice of window shots throughout the journey. 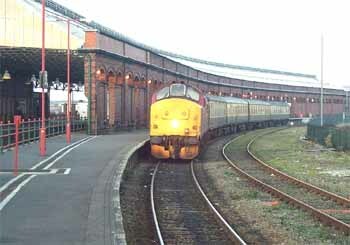 A lively pace was maintained into Chester which was deserted apart from thunderbird 47705 "Guy Fawkes". 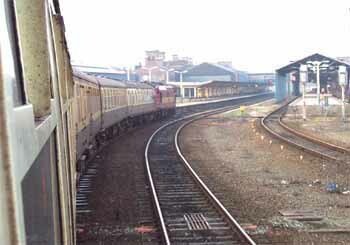 The train filled up a bit at Chester. We passed two "Hippos" en route to the County Town but there were none to be seen at the Alstom maintenance depot - are they all in service or behind the closed doors receiving attention? There was bright sunshine on the coast and the sea was calm but the temperature was very low with the consequence that a mist had developed as we progressed westwards. 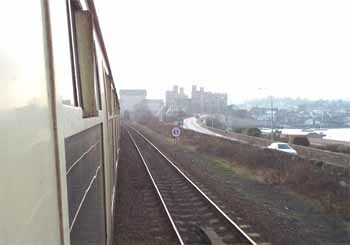 This is the approach to Conwy bridge and the castle can be seen in the gloom. Entering the tunnel and the customary blast on the horn to warn any stray personnel who might be inside! The castelations over the tunnel match the castle well and they are almost vertical this time. 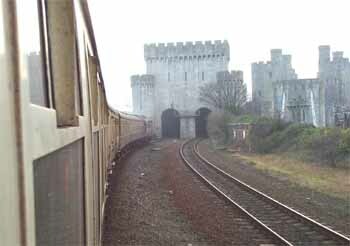 Through Conwy and on to the stop at Bangor before running onto the single track for the Menai bridge. 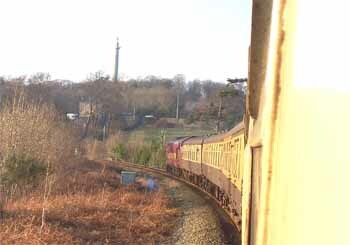 Once over the bridge the Marquess of Anglesey's Column can be seen up on the hillside and it doesn't really lean. Arrival at Holyhead still just a few minutes down so the correct pace had been maintained from Crewe, quite a few "bashers" on board again today - it's incredible how word gets around. The power of the internet I guess. 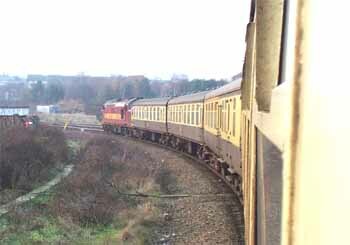 As usual there is no messing about on the runround and 415 was soon on its way to the head of the train to form 1K73. There had been no tea trolley on board from Crewe and I was spitting feathers (no, I don't know what it means either) so a few photos and a trip to the cafe - brilliant. A period shot of 37415 quietly ticking over in the warm(ish) sunshine. This locomotive has a different tickover from most of the other coastline engines - I wonder why? 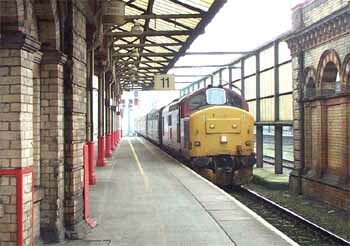 Almost on this spot on 30th December 2000 I was fighting to photograph 37429 "Eisteddfod Genedlaethol" with the "last ever" 37 hauled train from Holyhead! Hmmmm. Where is 429 now I wonder? Almost 15.58 and departure time, the sun is well down over the yardarm and turning the locomotive a beautiful golden colour - was there ever a better livery for these engines? I returned in coach 5025 which also had a wheel flat and a big one at that, the coach shook at each hammer blow - I do not know how the bearings take such abuse. 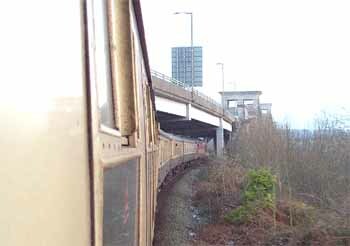 Back over the Britannia Bridge and onto the mainland running dead on time. A real cracking pace to Chester where, despite several checks on the way in, we still arrived a few minutes early. 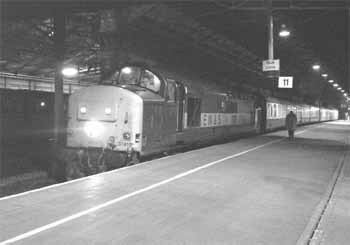 Crewe was reached dead on the nose and a black and white to finish. Another fantastic run to Holy Island and back - will it be the last?? ?